Is an audio cassette revival on the cards? Following the launches of Klevgrand’s DAW Cassette and Fuse Audio Labs’ TCS-68 plugins, both of which are designed to recreate the sound of the classic home recording format, Tascam has gone the whole hog and released a new pro-level dual cassette deck. Though the 202mkVII has the reassuringly familiar look of the deck that you had in your hi-fi all those years ago, there are some concessions to today’s technology. 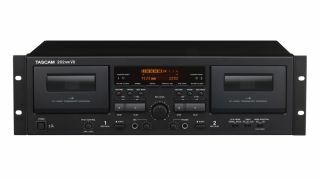 A rear-mounted USB output enables you to archive your cassettes to digital media, and there’s also a front-panel mic input so that you can mix a live input with the playback of Tape 1 and record it to Tape 2. The two decks can record and play back independently, and there’s a Special playback mode that enables you to monitor the sound from one tape using headphones while another plays through the line outputs. There’s support for normal, chrome and metal tapes, and a wireless remote control is included. The Tascam 202mkVII is available now for $500. Find out more on the Tascam website.